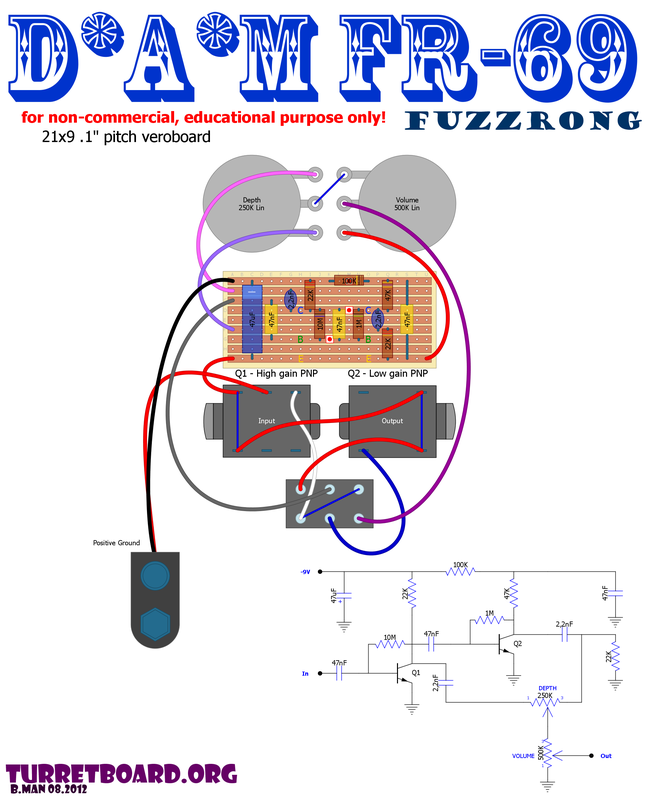 Another cool dirt box from D*A*M crew – FUZZ rong! For Q1 should be used Ge PNP transistor with higher hfe (try in 120-200hfe bucket) and for Q2 something with lower gain (65-80hfe bucket). New 0.1″ pitch stripboard layout! Get the project file [.pdf] here! Yo! Here’s D*A*M take on Dallas Rangemaster – Red Rooster! It’s classic treble booster circuit with added capacitor input blend and trimpot in place of 3k9 resistor on transistor emitter for better bias. 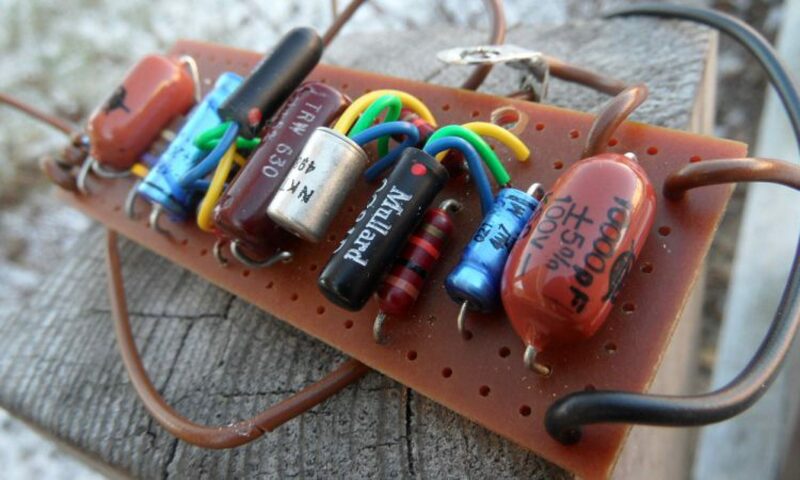 First roosters where made with excellent NPN germanium transistor CV7112 (military specs OC140). Later NPN units sports OC140 or OC139. Most recent PNP versions are equipped with many different transistor types – OC71, OC72, OC42, OC45, Magnatec AC128, CV7355 and CV7004. Text added and corrected PDF layout uploaded. Here’s layout for custom one-off MKI-ish Tone Bender called by D.A. Main “Logan Bender” made for one of D*A*M forum members. It’s MKI type Tone Bender with some interesting components values tweeks. In fact..
I’m not sure of Level pot value – maybe it’s 1M instead 500K due to lower output resistor (680K instead 2.2M)..? 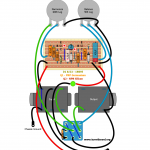 I don’t know if any of You are familiar with Pigdog Pedals… If not – You should! Steve’s work are always true art of work – for ears and for eyes, as well. Here’s lovely point to point layout for Pigdog Driver, which is… Yes! Treble Booster with added input capacitors blend. 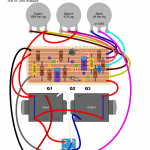 This allows to achive stock treble booster tones or even full boost! Additionaly output cap is increased. All other circuit components values are stock. There where builded 11 units in total and few more in smaller enclosure. All Drivers are filled with mojo parts and rare germanium transistors and dedicated to british racing legends. Some even sports legendary yellow Mullard OC44 or ultra rare OC70! It’s not the same layout as used by Steve in his Mini Drivers, but has the same specs. Here’s oldie TS9 from my private stash. As you see on pictures it was made 1984, S/N starting at 4, and most electrolytic caps with date codes starts on 84XX makes me to think that. There is no date codes or brand on the pots. Diodes have legendary blue stripe, back plate is silver “pre CE” type. 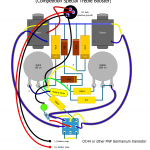 This and the rest is nicely visible on the picts attached..
Cross between fuzz and overdrive.